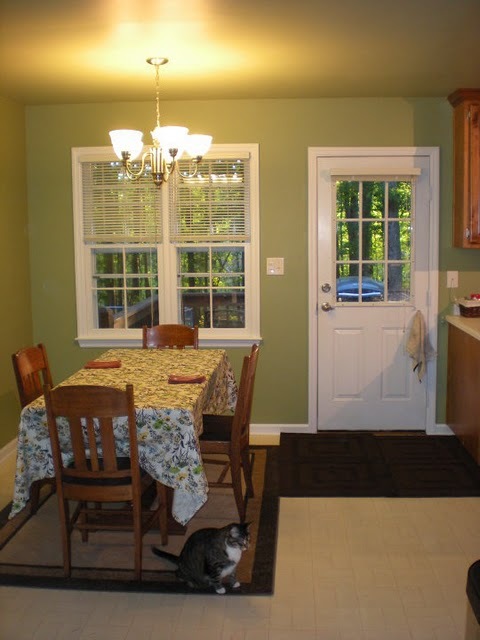 I know in my last post I teased you with the promise of a new kitchen wall color, which got delayed due to new windows. I’m making good on that promise today!! First off, can I just say that painting (and any project in general) takes 10x as long when you have to work solely during nap and bed times? Painting the kitchen BC (that’s “before child”) would have taken approximately a weekend to finish. Painting the kitchen AC (“after child”) took almost a month- taping happened one night after bed, then the walls got painted during a weekend, then I had to travel for work so we took a week off. Then the ceiling finally got painted over another weekend. I suppose if we didn’t mind being sleep deprived, we still could have gotten it done in a weekend, but I like my sleep thankyouverymuch! 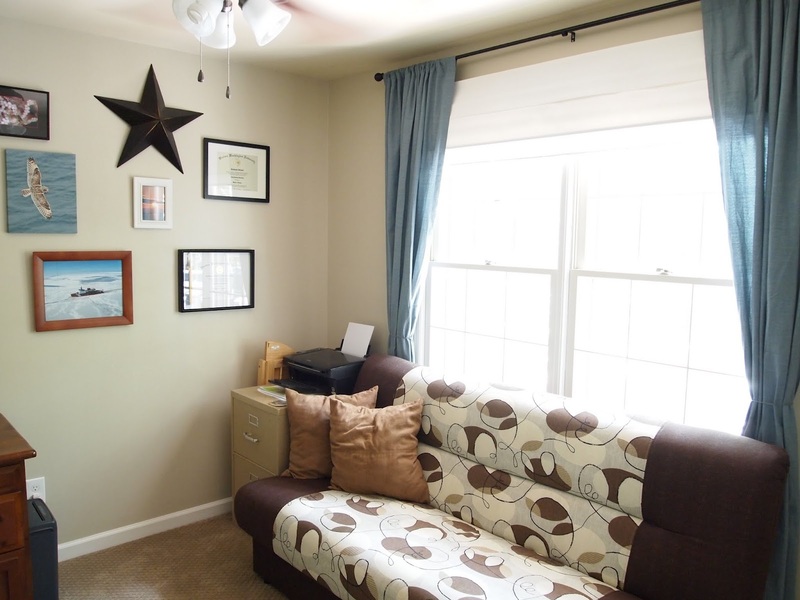 I wanted a color that was lighter than our original color (Behr’s Mother Nature) but that wasn’t a tan because the office and living room are both a shade of tan. I also wanted something with some grey to it, but not too grey. 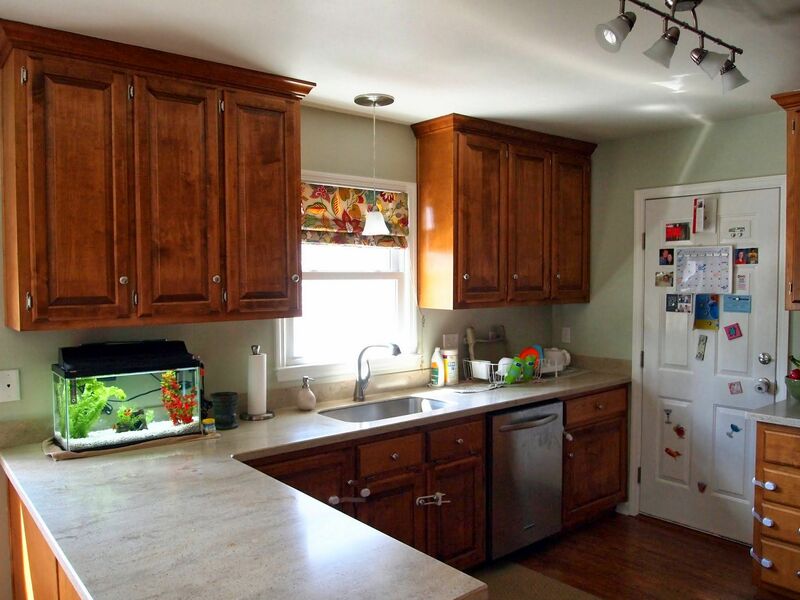 It had to play nice with our counters and cabinets too. I grabbed a million swatches, and painted a few test stripes on the walls (those are a good motivator to get to the actual painting process- we could only stare at those stripes for so long). I don’t usually spend this much time deliberating on a color, but I really didn’t want to have to paint the kitchen again- there is SO much taping involved!! I *finally* settled on Behr Mountain Haze for the walls and Behr White Clay for the ceiling. And oh boy do I love it!! The color is still a little bit green, but looks greyish at night. Oh what a difference some paint and a new window makes!! That window is the exact same size as the old window, but it looks SO much bigger. Oh yeah…so much better! 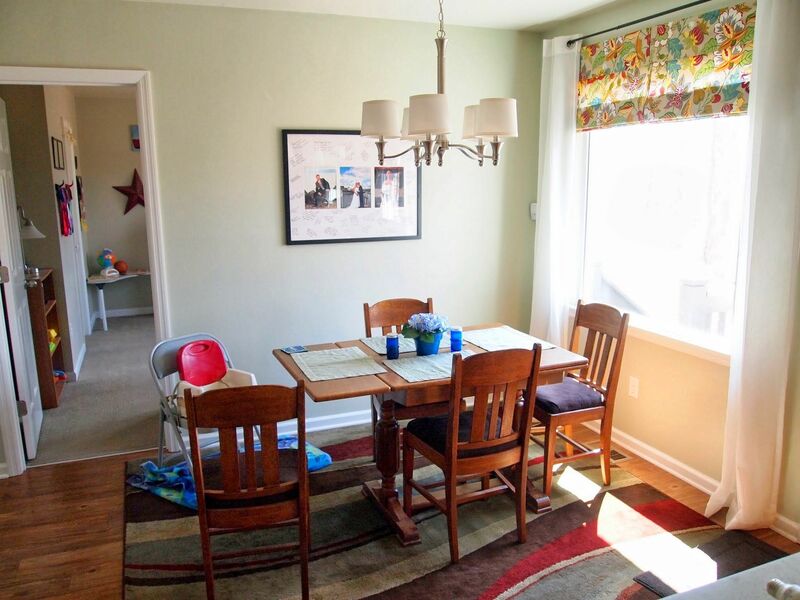 We got a new rug awhile back too for the dining room portion- we did have 4 (!!) rugs in there and it was just getting ridiculous when we were vacuuming in there. One big rug is much more manageable. The colors tie in well with the curtains and wall color (the rug came first though). And it goes well with the living room rug too. This photo is probably the best shot of our counter tops I have- it really shows off the detail and true colors (Corian in “Burled Beach”). I am still in love with them. You can also see we added some new pets to our family- 9 neon tetras and 2 corydoras (aka cory catfish). B loves to watch them swim, especially at feeding time, and has quickly learned to sign “fish”. It’s amazing what a little paint can do. 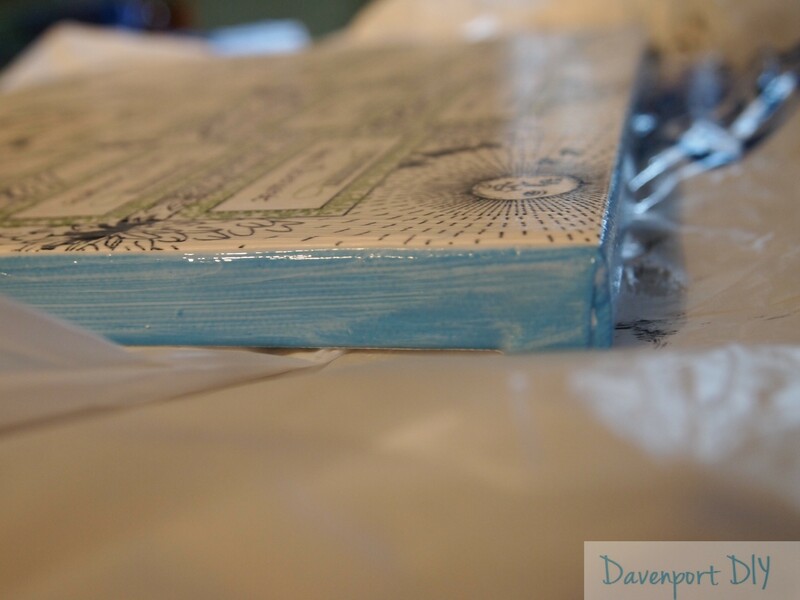 It feels so much lighter and brighter in there, which is exactly what I hoped to accomplish! I’m excited about the next project we are doing in this room, but I’m keeping that cat in the bag for now. I’m hoping we’ll get it done this summer but the way our projects have been moving lately, it might be more like fall. We’ll see. No promises!! What do you think? 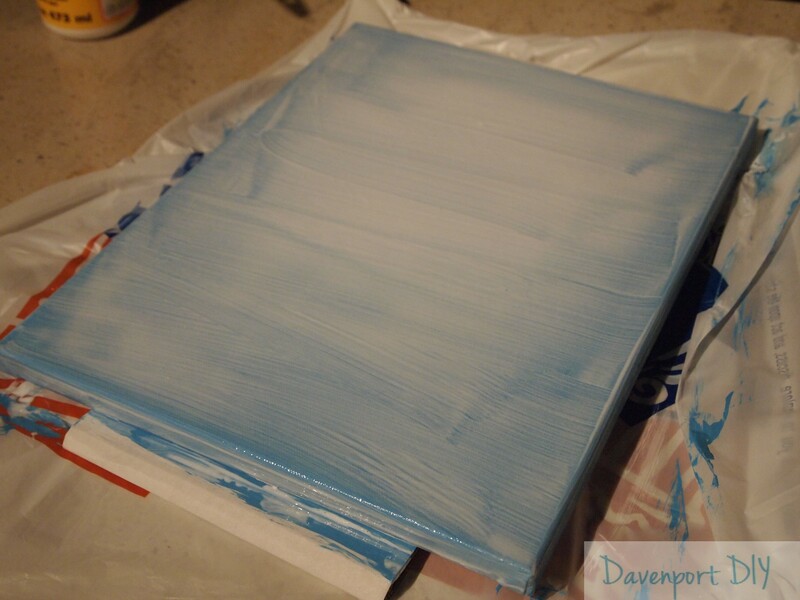 Have you painted anything recently? 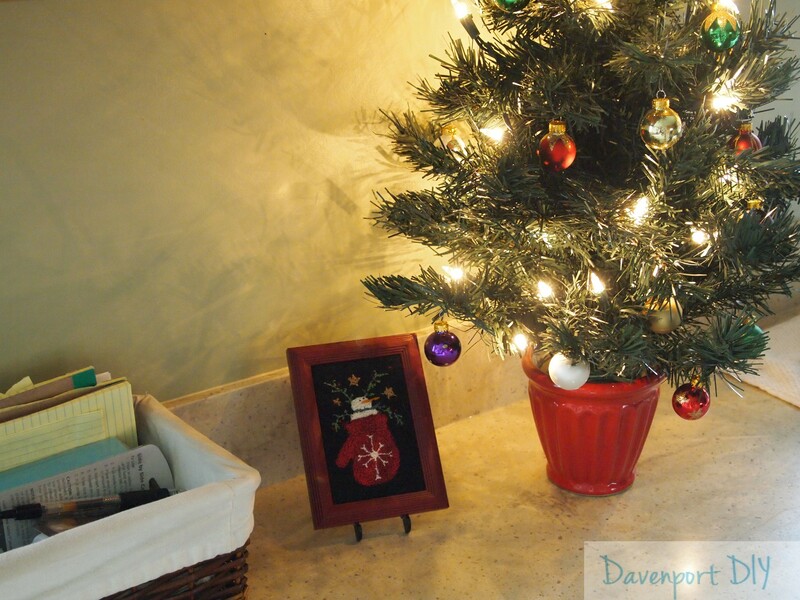 Deck the halls, inside and out! Hey everyone! 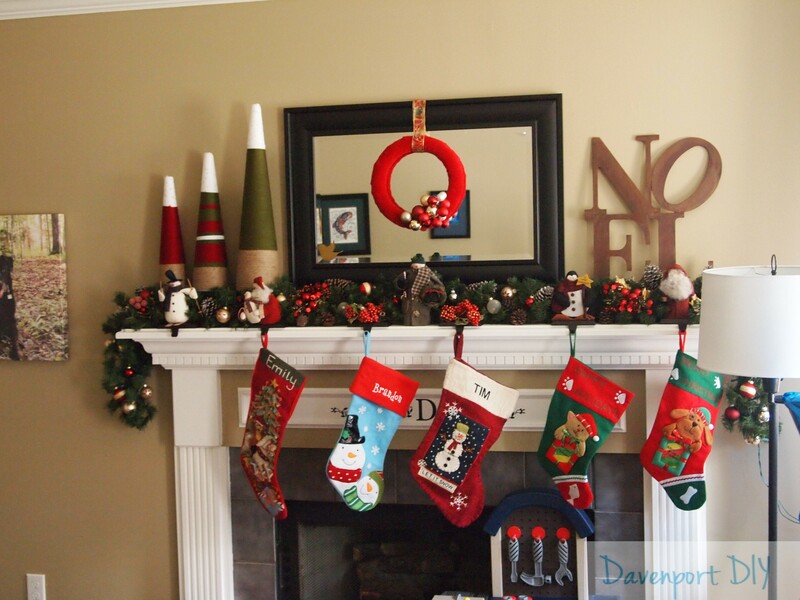 I’m skipping my usual “Tuesday Tips” this week to show off our Christmas decorations. I just love this time of year- it’s so fun to have our house all decorated, and to drive around and see all the lights up- it’s just so festive. We managed to get all the outside decorations up during B’s nap on Friday- a true Christmas miracle. Ha. I’m really happy with how it turned out! Why yes, that is a tool bench in front of the fireplace…just keepin’ it real around here! We don’t have our tree up yet because we get a live one, and that sucker would be crispy by the time Christmas rolled around if we got it now. So we’ll wait until the middle of December- I can’t wait for that fresh pine scent! I do have a mini fake tree that I put up on the kitchen counter though- is it weird that I really kind of want to keep it up all year?? And our dining room table isn’t fancy- normally I do more than this, but B is so curious these days I figured he’d either want everything on there or pull a tablecloth off the table. 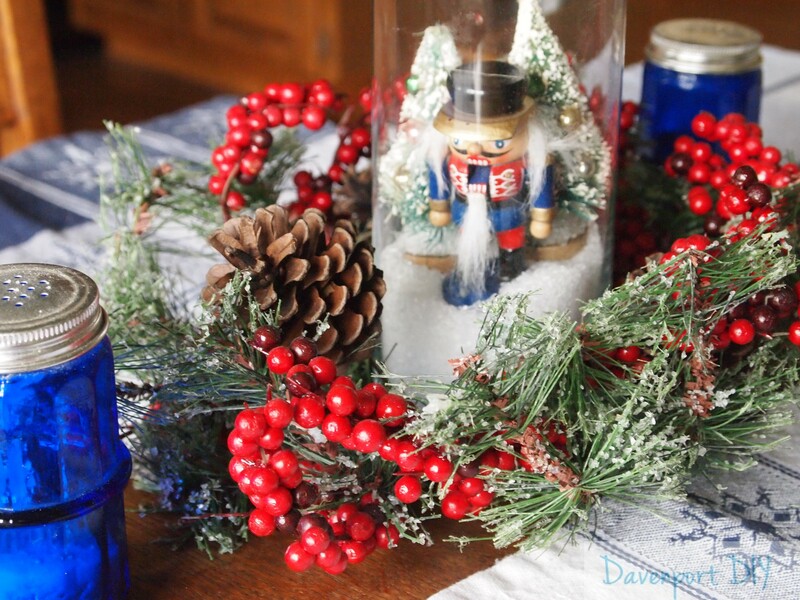 So I just put out some simple place mats and a centerpiece- the glass vase has a wooden nutcracker, a couple of mini fake trees and some epsom salt snow! 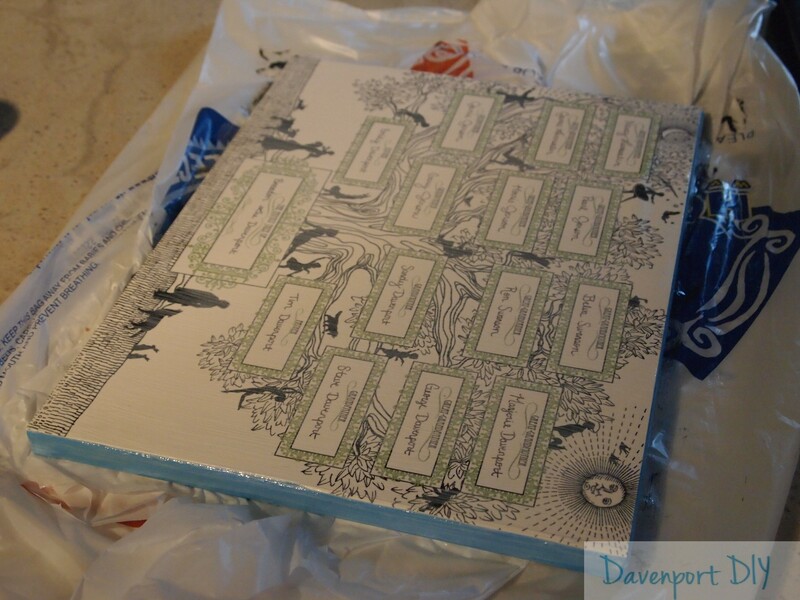 Linking up to Dare to DIY at Newly Woodwards! 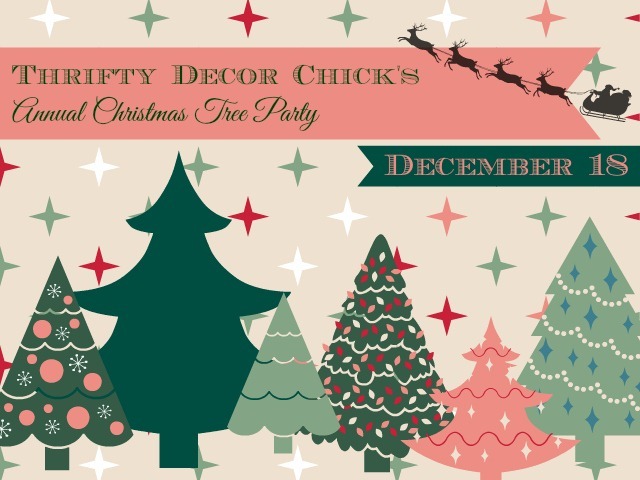 Linking up to Thrifty Decor Chick’s Christmas Party! I put a couple of finishing touches up in the office over the weekend, and I’m completely satisfied with how things look. I still smile every time I walk into this room, and actually enjoy sitting at my desk to use my computer, which means this little room has come a long way!! To see how far, check out this post. I love those hooks- too cute. And in Georgia bulldog colors, of course. The frame is from the dollar store- I was actually pretty impressed with their frame selection. I picked up a bunch and will share what I did with them later this week. Nothing too exciting- I wanted to keep it light and bright in there so I just went with a plain white one. It ties in the white cover of the chair at my desk. I tend to lean towards the bamboo roman shades, but thought this room had enough dark furniture/wood in it so went with something different. The shade is this one (Savannah III 72×64 in bright white, just in case the link stops working), from JCPenney. Done done and done- love it!! So happy to have this room completely checked off my list. I think my favorite part of decorating for the holidays are the outside decorations. I remember my dad decorating our house when I was a kid- we had a big light-up snowman, a couple of giant candles that said “Noel” on them, and a bunch of lights and garland on our front porch. There’s something so magical about driving/walking up to your house at night and seeing it all lit up. I’ve carried on the outdoor decorating “tradition” at each house my husband and I have lived in. 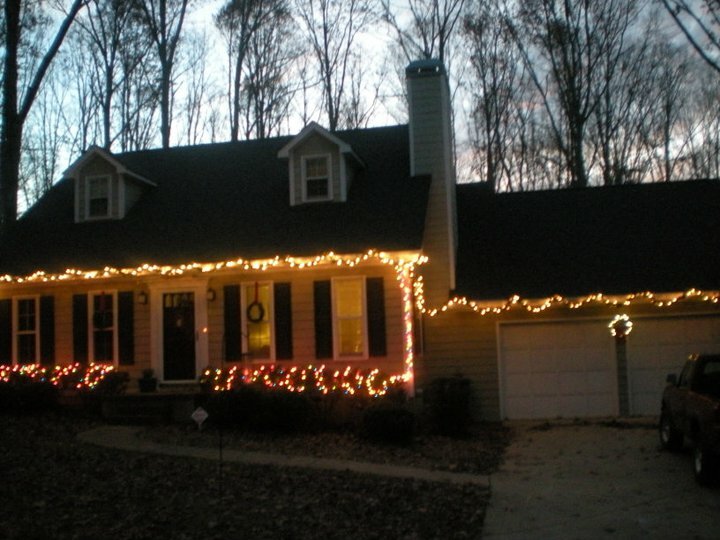 It varies depending on the outside of the house, but lights end up out there some where!! And believe it or not, I do 95% of the decorating. Yep, I get up there on the ladder and figure out what lights plug in where. Don’t worry, my husband helps too- usually by holding/moving the ladder and handing me lights. I think he enjoys helping, but is probably glad I don’t make him do most of it. Actually, this photo is from last year. I don’t have a good photo of the entire front this year. 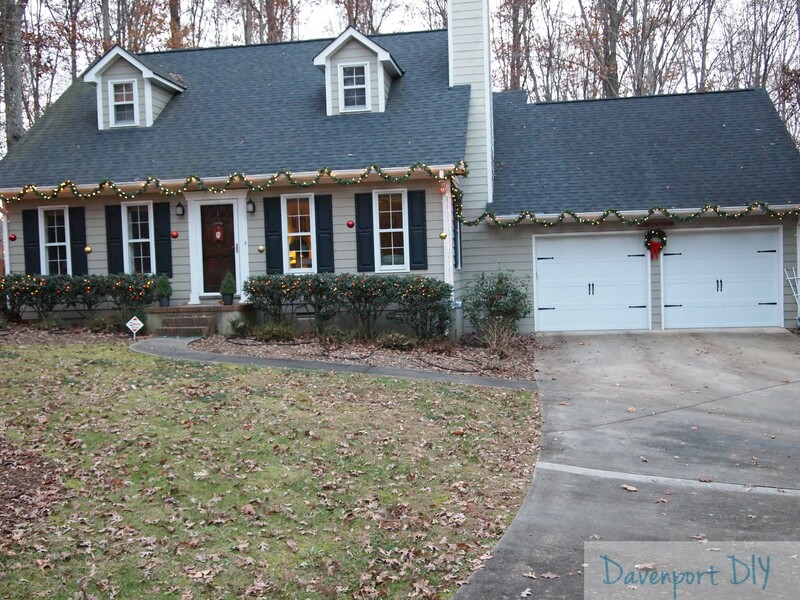 BUT, the garage looks the exact same this year, I’ve just changed some things about the front of the house. Can you spot what’s different about this year?? If you guessed giant ornaments, you win!! I think I made my garland swags bigger this year, because I mysteriously ran out of garland about 4ft from the end of the house- whoops. So I stole one of the wreaths that I had hanging in front of the windows (made out of leftover garland from last year) and used that- which is why there are no wreaths in front of the windows this year. When my parents were visiting, my mom and I made a trip to Hobby Lobby and came back with the giant ornaments (50% off thankyouverymuch). I wasn’t sure where to hang them, as the original plan was to put them in a tree in the front yard, but I didn’t like the look once I got started. As luck would have it, I had just the right amount to hang them from the garland- and I like it!! So does my husband. They’re shatter-proof so they should hold up, even if it gets really windy. Also none of them are hanging directly in front of a window so we shouldn’t end up with an accidental broken window. 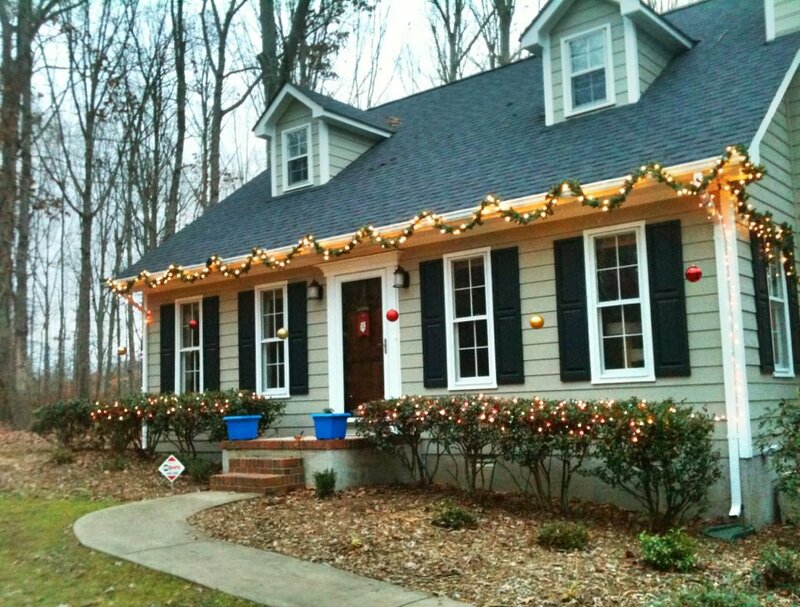 I love having our house all decorated- I wish we could leave it up year round. It makes me smile to see it all pretty and sparkly. What do you think? 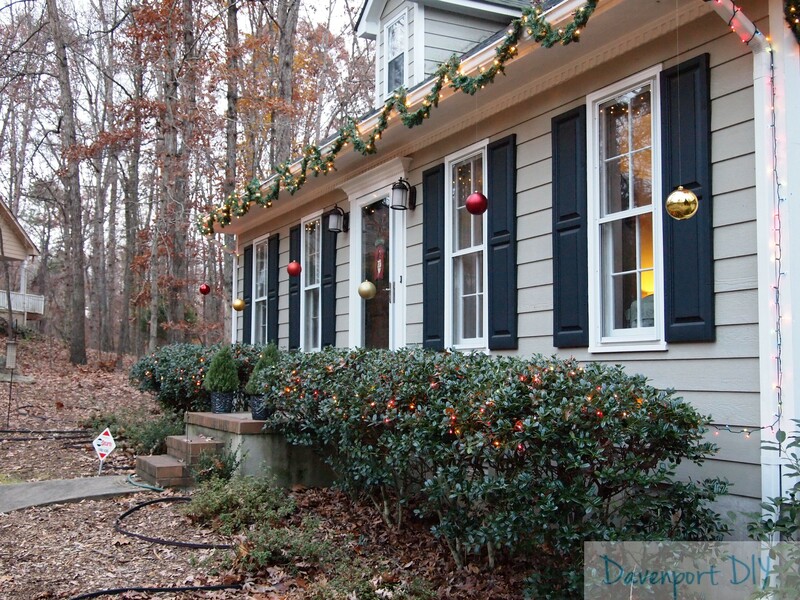 Do you decorate the outside of your home for the holidays? 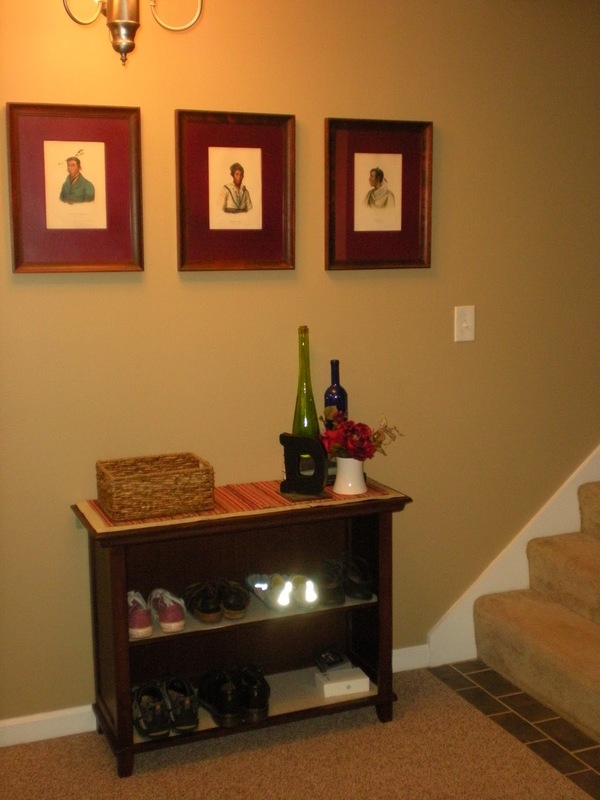 Sometimes I get stuck on finding something for a space in our house- example: we needed a place to corral shoes by the front door, because I was getting sick of tripping over a big pile of them every time we came home. So I searched, and searched, and searched for a shoe rack that would look decent, with no luck. Problem was, I had tunnel vision and was only searching for “shoe rack”. Sometimes I need to step back and think outside the box. What else can hold shoes? What else do I want to use this for besides holding shoes? How big do I want it to be? 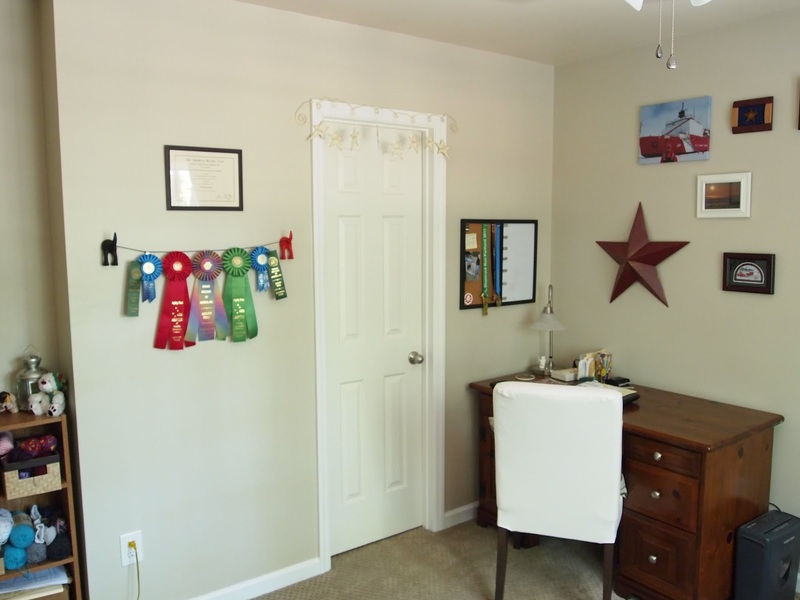 I loved the look, color and the dimensions were perfect for the space. Sold!! When it arrived, I was pleasantly surprised- it has a lot of craftsman details that you can’t see from the online photos, and it’s solid wood. My husband put it together for me, and we both loved it. 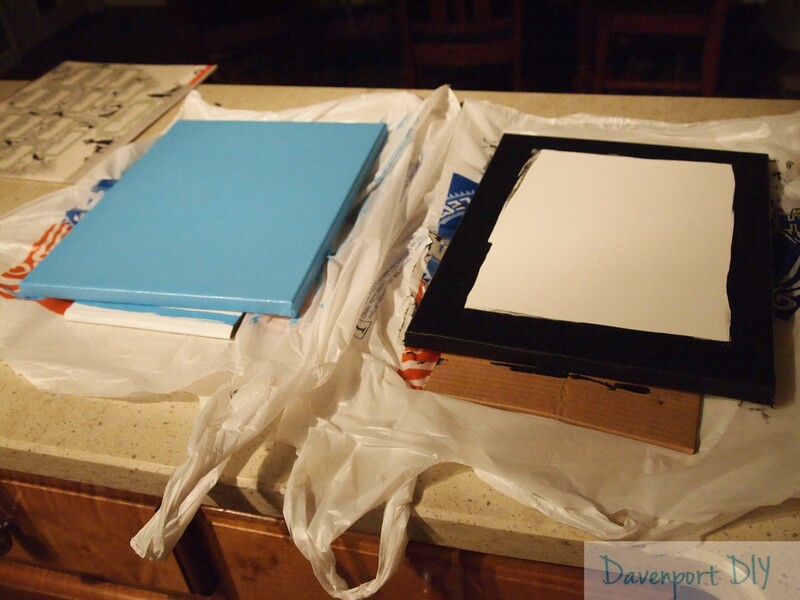 He even had the idea to add some shelf paper to the shelves to protect them from mud/dirt from our shoes- genius! Sorry to blind everyone with my running shoes- whoops. It’s a perfect fit- to the left is the downstairs bedroom door and our front door. I dressed it up with a basket to hold keys/wallet/cell phone/mail and a couple of accessories that we already had. Verdict? We use it all the time! I can’t believe we lived here almost a year without it- it makes such a difference. Ok, it was never this messy- this is from when we first bought the house! And here’s the entry now! It was a happy accident that the color almost perfect matches the frames above it and the front door- I guess it was meant to be. 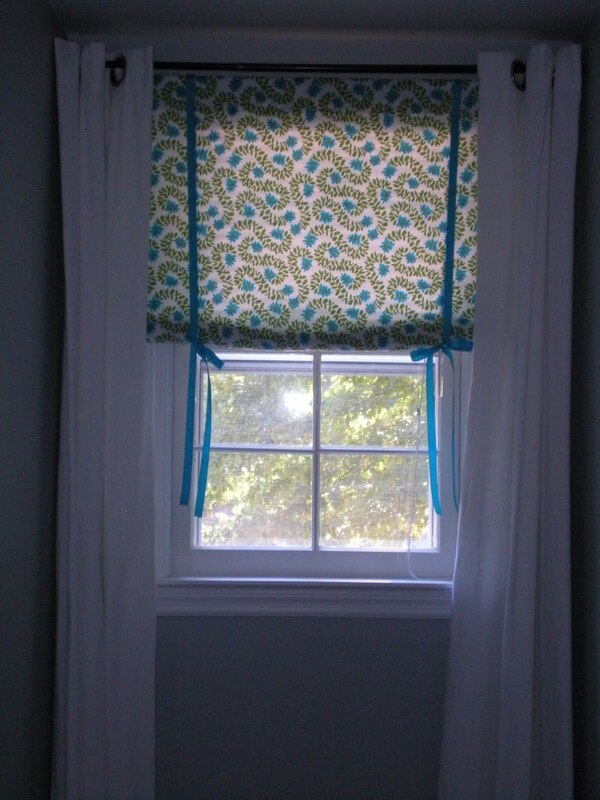 I’m back, with a really simple tutorial on how to make a pretty fabric window shade! If you can sew a straight line (or even iron a straight line for that matter) you can make this shade. When we bought our house, we inherited 1980’s off-white metal blinds. yay. I guess I should consider myself lucky that we had any blinds at all. Over the past year, I’ve been slowly replacing them to pretty things up. You saw the shades in the kitchen and dining room- I did NOT make those. But I did hang them!! 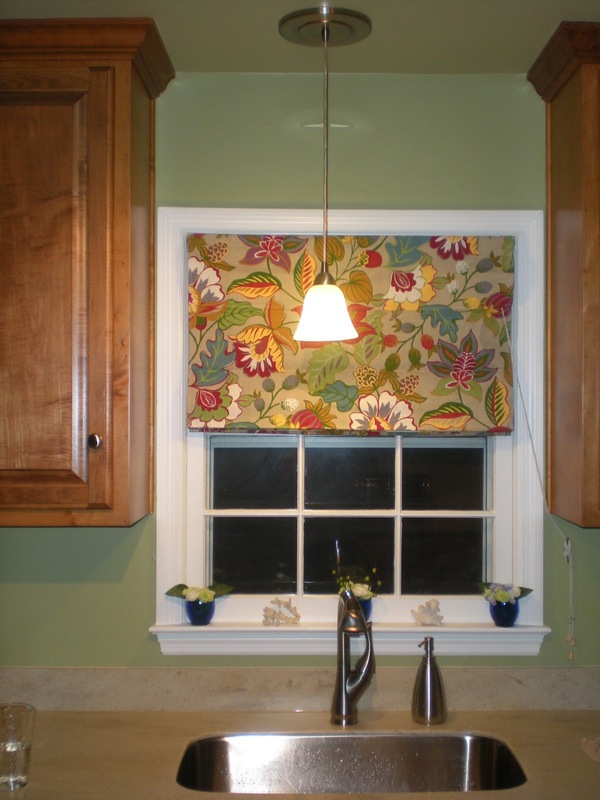 Start out by measuring your window- you’ll need to measure the width and length of your window, factoring in the placement of your curtain rod (is it going inside the window? above the window?) and allowing a little extra for a rod pocket and hems. Cut your fabric to the appropriate size. 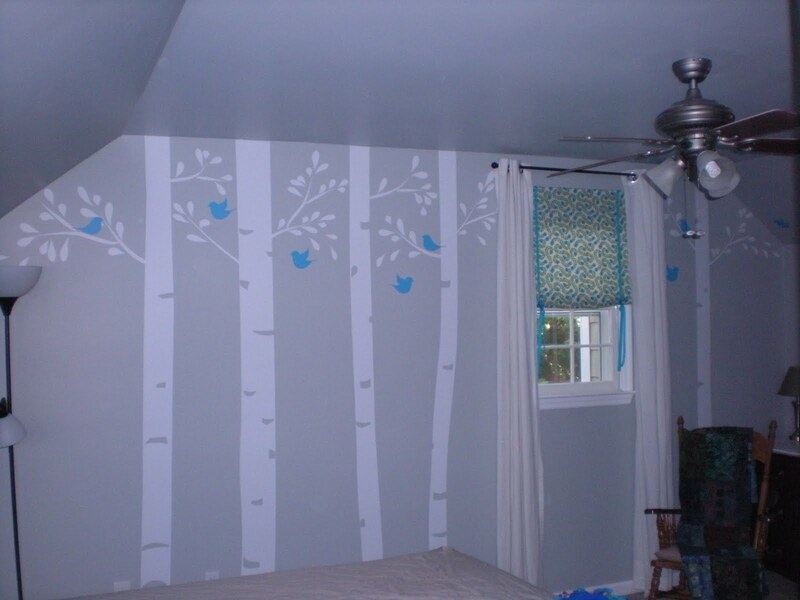 FYI- there are a lot of great sites out there to buy fabric from. In fact, Pinterest has a great link kicking around out there: 30 great places to buy fabric online. I’d like to add one more to the mix and suggest Tonicliving.com, which is where I got my fabric. They’re great! Iron out any wrinkles and iron your hems- I like to do this before I sew, it eliminates the need for pins (unless the fabric is really stubborn). If you’re planning on using iron-on hem tape, hem your fabric now with the iron. You’ll want to hem the sides and the bottom. Otherwise, sew your hem with a sewing machine. Fold over the top of the fabric for a rod pocket and iron- I made a 3″ rod pocket on mine- you can make yours as large or as small as you’d like, just make sure your curtain can slide on to the curtain rod. If you’re using iron-on hem tape, go ahead and secure your rod pocket. If you’re using a sewing machine, wait one step before securing your rod pocket. Once you’ve ironed your rod pocket, you’ll want to figure out where to place your ties- what I did was to take two long pieces of grosgrain ribbon and place one approximately 5″ in from either side of the curtain. 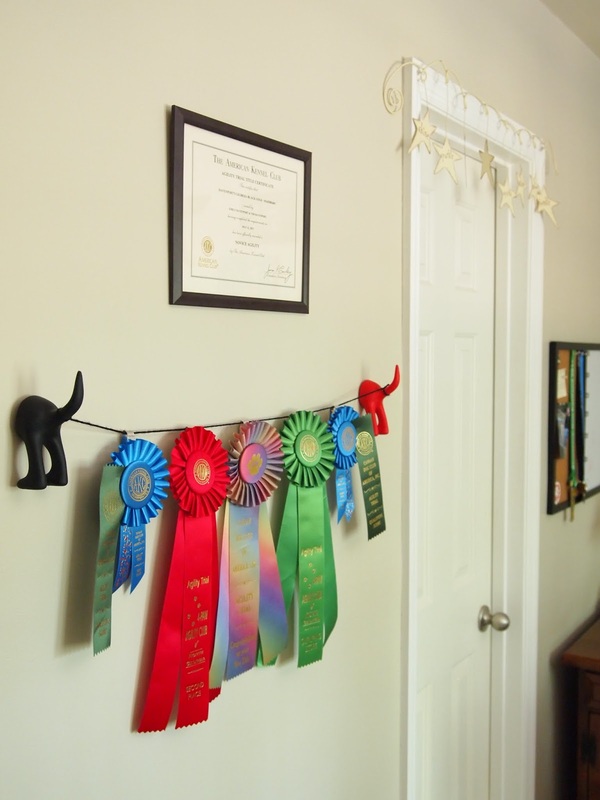 I made my ribbon twice the length of the curtain, and folded it over the top (so an equal amount hung down the front of the curtain and the back). I then pinned my ribbon in place close to where I was planning on sewing down my rod pocket- my plan was to secure both the rod pocket and the ribbon at the same time. If you’re sewing, you’ll only be attaching the ribbon in one spot- where you’re attaching your rod pocket. I just sewed a straight line across my fabric and ribbon, which secured the rod pocket and the ribbon all at once. Easy peasy (or not, since I’ve once again failed to take pictures so all these words may be completely confusing!!). All that’s left to do is hang your curtain rod and new shade, roll it up and secure it with the ties. Want to see mine? Two layers of curtains- shade is on this rod from Target. Fabric is Meandering Vines from Tonic Living. Ribbon is grosgrain leftover from our wedding. I did leave the white metallic blinds up- they are just hiding behind the shade. I figure they add another layer to make it dark in the room if necessary. Another option would be to add a liner to these shades to help block the light. This room is still a work in progress, and unfortunately right now it’s still a cat room (although it can also function as a guest room) so we haven’t done much more to it. At least now the cats can enjoy some pretty shades, right?? I’m back again, with another bathroom post. Don’t worry, we only have 2 bathrooms so this will be the last bathroom post! Giant mirror and 80’s light fixture? Check. 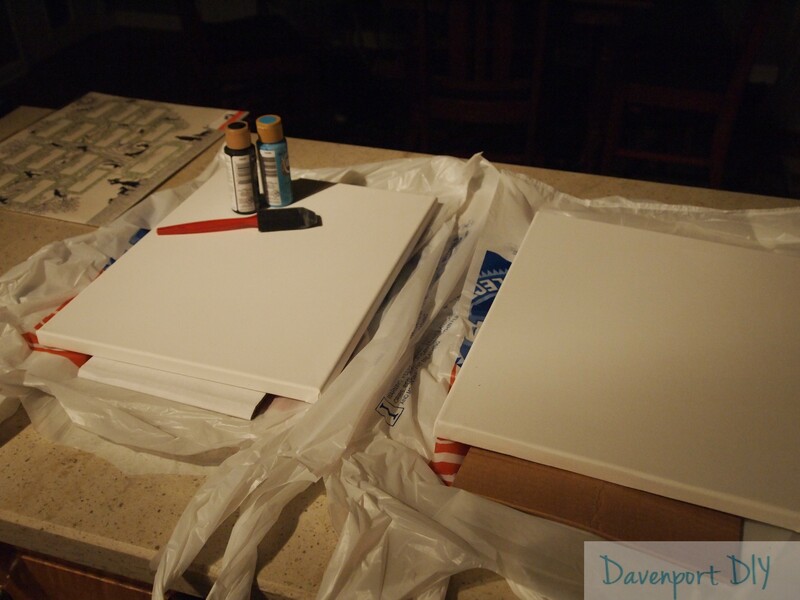 White laminate counter top and linoleum? Check. Towel shelf precariously hanging on wall (wouldn’t be able to hold a towel)? Check. The first thing we did was remove the giant mirror, because we needed to have it cut down (it too was held on by plastic flower clips, 4″ in from the sides. Bizarre). 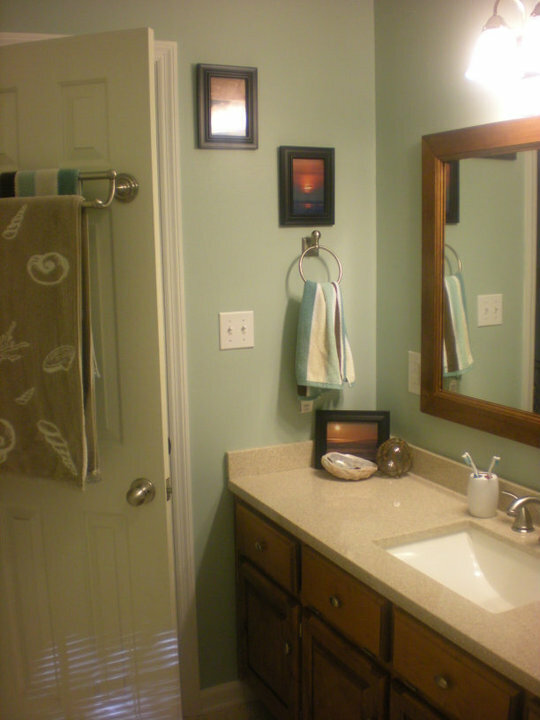 A tip- any local glass shop can do this for you, and to cut ours down it cost around $20 per mirror. 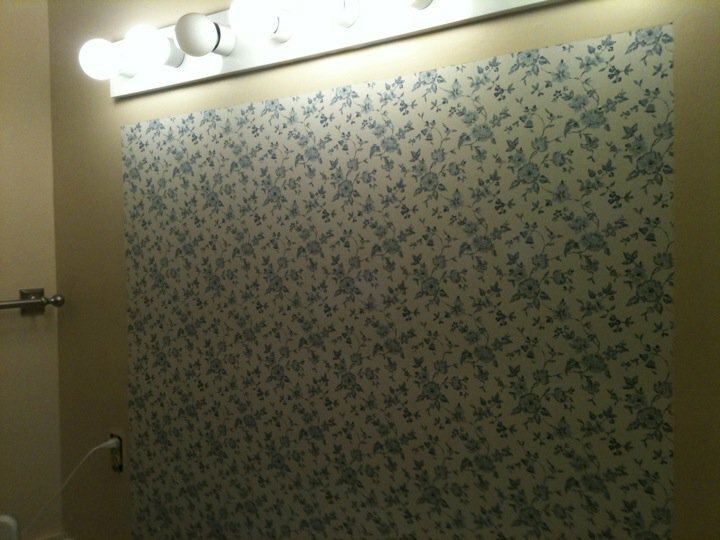 This beats buying a new mirror- even cut down ours measure ~4 ft x 3 ft.
Because the wallpaper had been painted over many times…we painted over as well. Not ideal, but way less work than removing it. We did remove pieces that were peeling off, then put spackle over the line between the wallpaper and bare wall and sanded in smooth. We have flat walls, and I think this method worked well- you cannot see areas where we spackled. Where the prior owners spackled? You can see that. And we’ve fixed some ugly spots thanks to them. 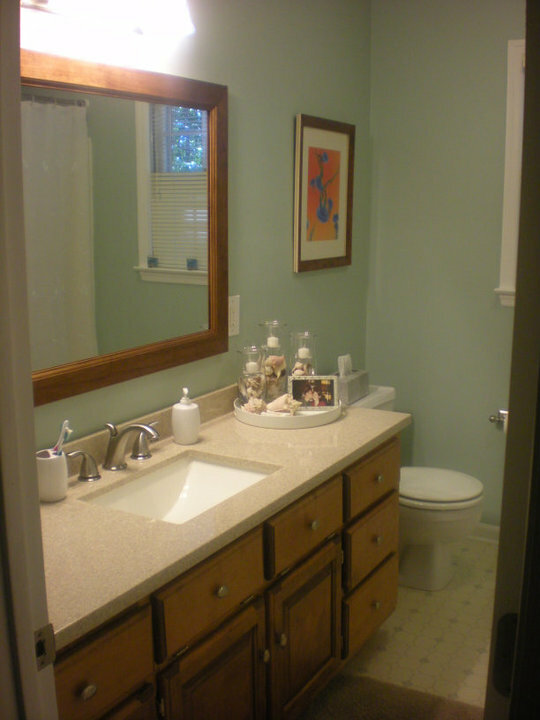 We used the same counter top, faucet and light fixture as the downstairs bathroom, which we installed ourselves. The mirror got framed in this bathroom as well- hmmm, I think I should write a separate post on how to do this, since I googled all over the place to figure out how. 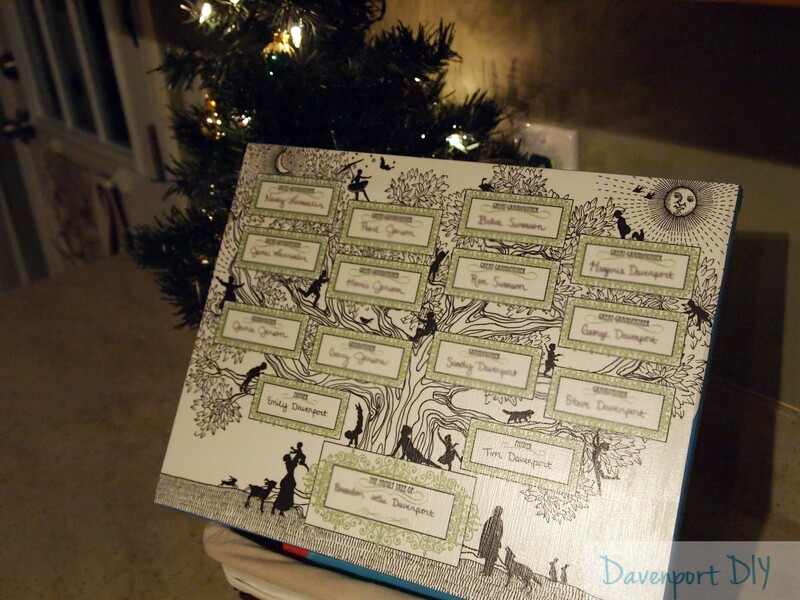 I sadly do not have in process pictures, but I can certainly explain how we did it – I think it turned out well. We did not re-do the floors in this bathroom- that’s on the future to-do list. The floors are fine (and thankfully no rotten floor in this room- yikes, I can’t even begin to imagine how we’d deal with that in a 2 story house!) just not updated. When we do the floors in this room, we’ll probably use the same vinyl flooring as downstairs, (we still have an almost full box left from downstairs- hmmm, that reminds me, we should buy it before they discontinue the color!) but we are NOT removing the linoleum first. We are going right over the top- because I am never removing linoleum again. That was a nightmare. Done! 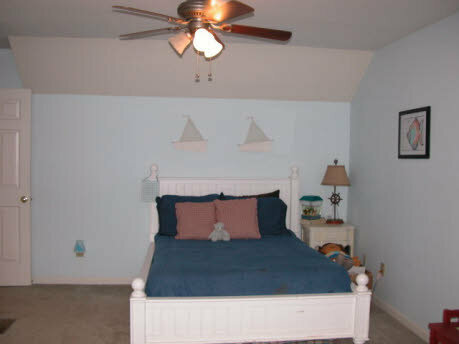 We used Contemplation by Behr as the wall color. This color is the same color that’s in our master bedroom closet and master bedroom ceiling. Master bedroom walls are Sage Grey by Behr. And a view from inside the room. The picture frames have changed since this picture was taken- they’re now white. That’s the upstairs bath!! I love it- it’s very calming. Thankfully this was a pretty simple re-do. Not like the downstairs bath (which you can read about here). 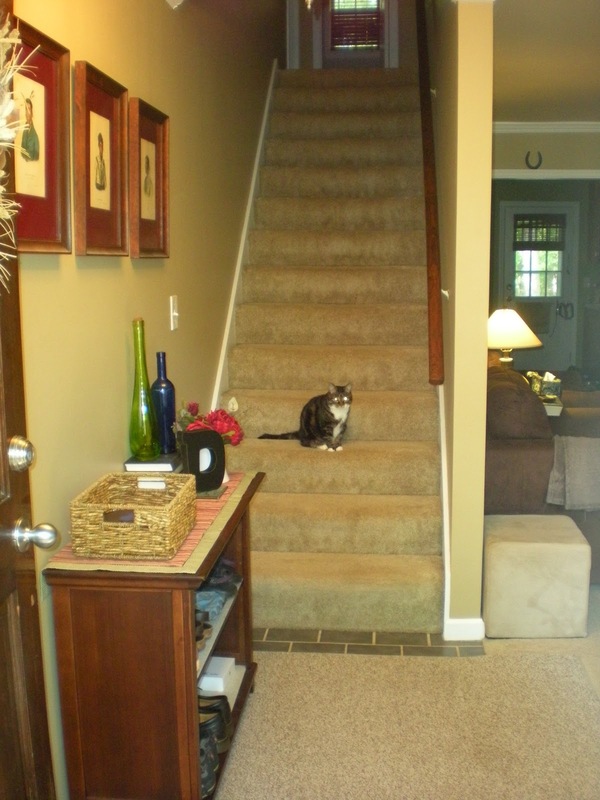 What’s your favorite room in your house? I’m not sure if this room is my favorite, but it’s pretty close! I’m not going to say anything about how this is post #2 in as many days, for fear of jinxing my progress. Whoops- guess I did just say something. The blood red kitchen and lovely white counter tops. Plus old, inefficient appliances. 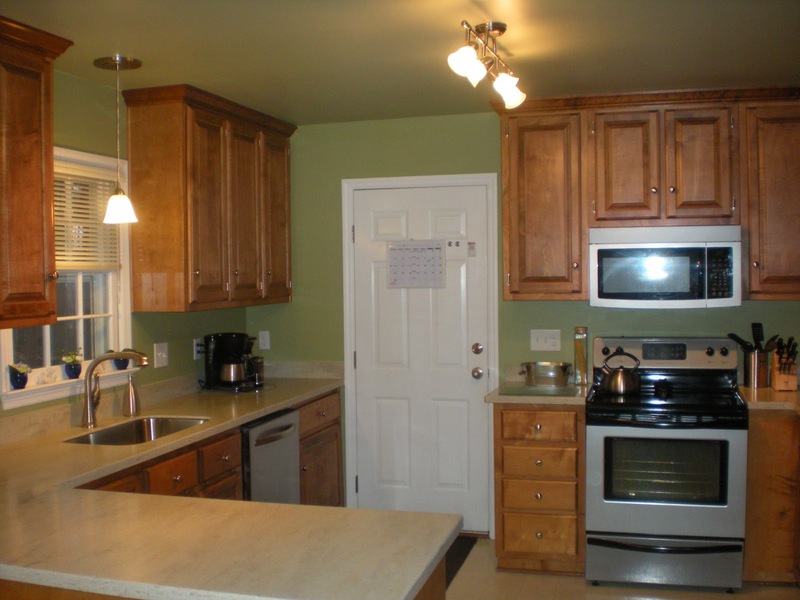 I’d always wanted to do a kitchen in green, so off I went to get a million paint chips and tape them to the walls. My husband actually made the color choice, going with Mother Nature by Behr. The ceiling is actually a couple of shades of green lighter- I’m not 100% on the color, it’s either Corn Husk Green by Behr or Rejuvenate by Behr. Whatever it is, it’s pretty. 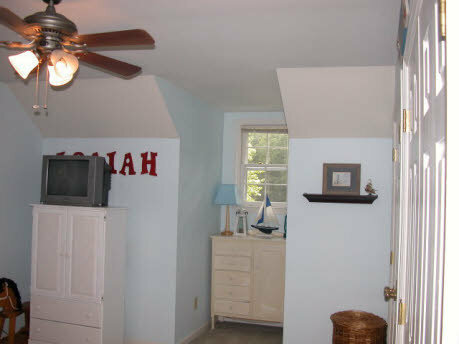 I do wish that either a. I’d chosen a shade or two lighter for the ceiling, because only in certain lighting can you tell there is a color difference or b. that we had crown molding in the dining room to better separate the two colors. 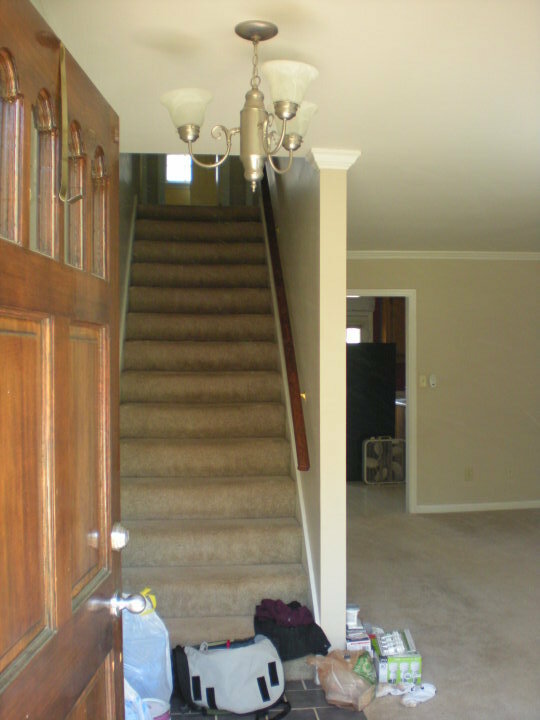 The crown molding idea is still on the table, we’re just not 100% sure how to do that because our cabinets already have crown that meets the dining room wall- installing crown in the dining room would involve taking off the crown on the cabinets and cutting it. Not to mention I would like white crown for the dining room- and that cut would have to be perfect in order to match up between the white and wood crown. It makes my head spin, I tell ya. 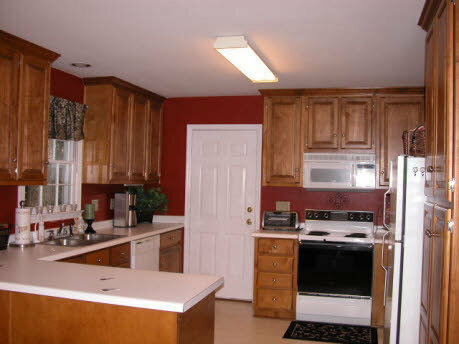 Kitchen with new paint, new appliances and new lighting. You can see here how the dining room is right next to the kitchen. 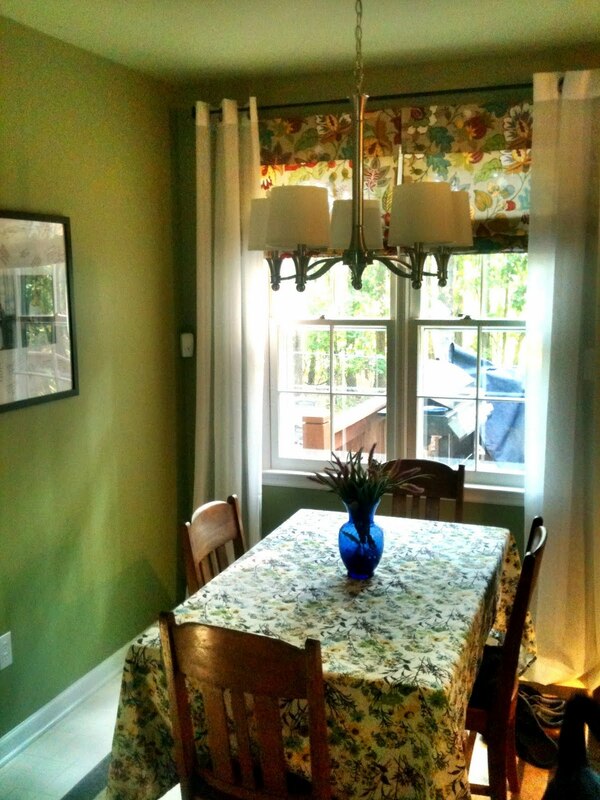 The dining room didn’t get much of an upgrade- we painted and installed the light fixture in the opposite direction. Not my favorite light fixture but it worked so we went with it. Oh and we also changed out all the door hardware from brass to brushed nickle and light switches/outlet covers from almond to white (this trick is by far the cheapest, easiest thing you can do to instantly update a room). Dining room and a kitty- that’s Amber. She loves to be the center of attention. At Christmas, my parents generously gifted us with a new dishwasher and microwave, rounding out the stainless steel appliances in the kitchen. About a month later, we’d had it with the laminate counter tops and bit the counter top bullet. I’d been eyeing Corian countertops for several months- I liked the solid surface (no way was I going to deal with laminate again) and the fact that they are man-made. Plus the color goes through the entire counter, so if there’s ever a scratch we can just sand it out. We even went to Home Depot** a few months prior to our purchase and picked out a bunch of tiles to choose from and then harassed asked everyone who came to our house to pick their favorite. Once we’d narrowed it down to 3 choices, I ordered 10″x10″ tiles directly from Corian. If you’re going to make a large investment in counters, you won’t regret spending the $15 per tile to see a bigger version of your teeny tiny sample tile. 2 of the colors we thought we liked were gross in large tiles, and the one we were just so so about was gorgeous in a large tile (the tiny tile left out SO much detail). And we actually use the sample tiles all the time as trivets for our hot pots and pans- bonus! 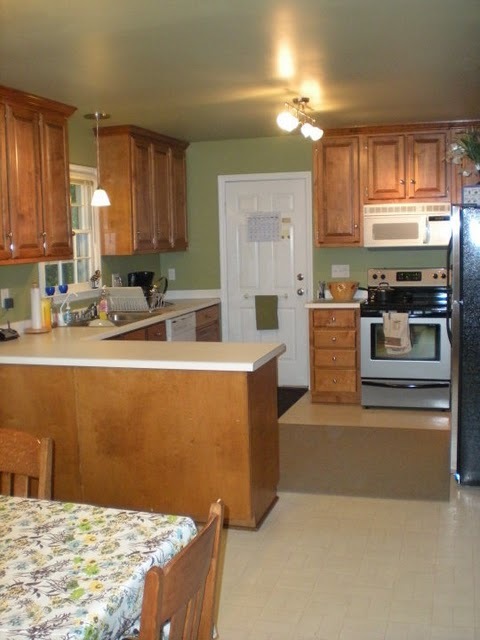 With the pretty new counter tops, the rest of the kitchen was looking a little bland with only wood, stainless and green. I had to spice it up a bit- we don’t love clutter on the counters so colored accessories were out. One day I happened to stumble upon a shade at World Market** that I knew would be perfect! Lucky me, it was on sale and the perfect size for the window (they’ve since sold out of this shade- insert giant sad face here). The shade was SO pretty I quickly snatched up 2 more for the dining room windows, because the dining room was looking sad in comparison. I installed them as outside mounts because they were the wrong size for inside mounting- I think they worked out just fine though. We also just recently updated the chandelier in the dining room- the one we’d flipped always hung slightly crooked and too high above the table. I found this one on sale at Home Depot and snatched it up. LOVE. New shades and chandelier in the dining room make things feel more cozy. And that rounds out the tour of our kitchen and dining room. We love it. The only thing left to change is the flooring (which is about as annoying as the counter tops were) but that’s something that’ll have to wait awhile- for now we’re pretty happy with our pretty kitchen and dining room! **Disclosure: I was not paid or compensated in anyway by these companies for this post.